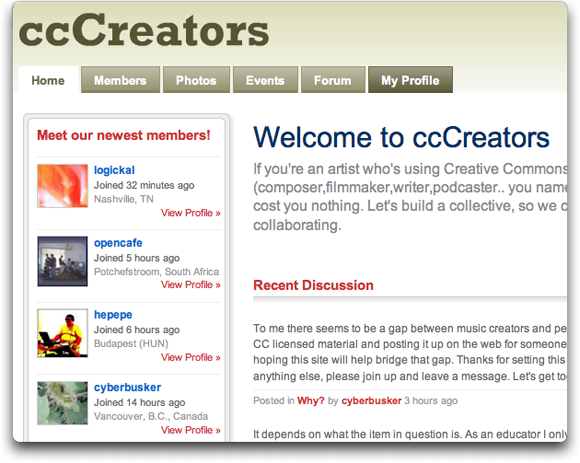 Any Creative Commons creator can join for free. So if youÃƒÂ¢Ã¢â€šÂ¬™re a composer, a filmmaker, a podcaster, a writer, you name it, please join! As far as I know this is the first community which is so broadly oriented and Creative Commons based. Sure, I love to talk with other composers and remixers about music, but wouldnÃƒÂ¢Ã¢â€šÂ¬™t it also be nice to communicate directly with the new generation of filmmakers for example? Connecting filmmakers and composers. At ccCreators we can have discussions about all sorts of things, share photoÃƒÂ¢Ã¢â€šÂ¬™s with each others, add events to the calender and start new collaborations. It could become a killer website. So please join! No sneaky commercial reasons, just a way to connect to creators, artists using Creative Commons. Sounds good to me. If you do join up, send us a link to your page on our Share Your Work forum and let us know how it goes. Welcome to Create Digital Motion!